Laphroaig: celebrates 200th anniversary with Twitter campaign. 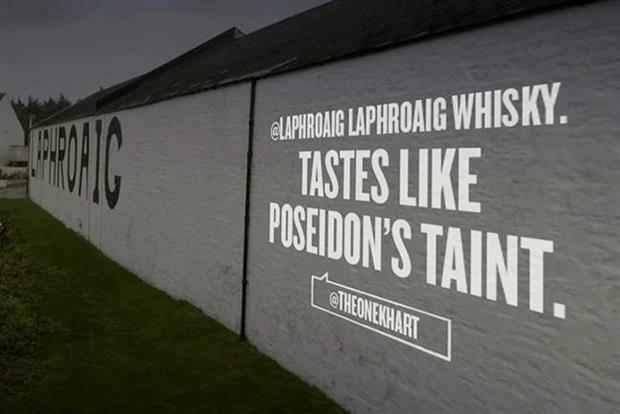 Laphroaig, the Scottish whiskey, will project opinions of the brand sourced from Twitter onto its distillery wall, to celebrate its 200th anniversary. The campaign called "#BigOpinions" kicks off today. Laphroaig will select the best tweets — both positive and negative — from 21-25 July and will project them onto its distillery in the Isle of Islay, Scotland, on a space measuring 67 feet in length. The best 200 Tweets of the year will also be written on individual tiles on a wall at the distillery in Islay. The aim is to connect Laphroaig drinkers across the world with the whiskey’s Scottish home.